Here we are in the new year!! We had an eventful 2018 in Kleinbaai. Firstly the southern right whales were here in their full force. With the annual whale count, it was evident that the whale season was an extremely good one. Compared to the 2016 count, there were more than 10 times as many whales in 2018. The view from Aire del Mar’s windows rewarded us with many spectacular sightings. Sadly, sightings of the great white shark were not guaranteed throughout the past year. The two Orcas that come and go to our bay, tend to disrupt the certainty of encounters by shark cage divers with this majestic creature. I might add that the copper sharks try their best to replace the shark effect for visitors to our area. Another exciting annual event is the Trans Agulhas Inflatable Boat Race. For the last couple of years, the winning team chooses Aire del Mar as their accommodation on the second last leg of this epic race. 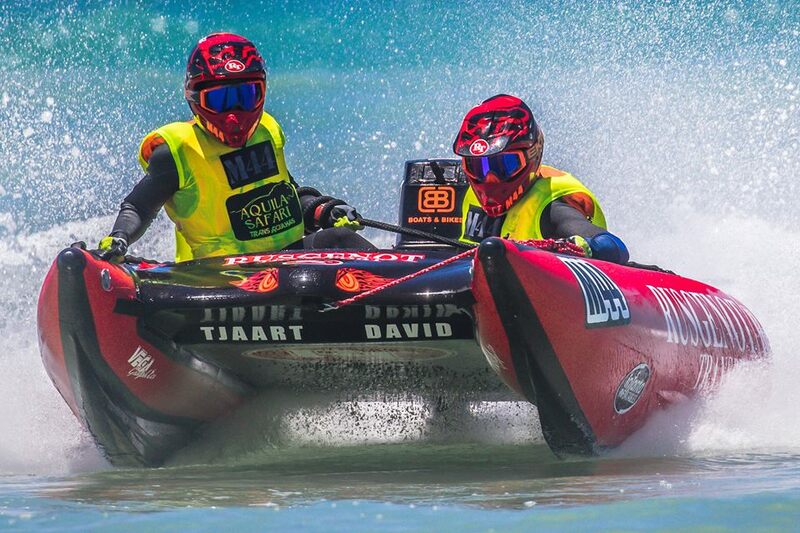 David Barnet and Tjaart Oosthuizen the winners for the last 13 consecutive years have been teammates for the last 16 years of this gruelling race known as the most difficult inflatable boat challenge in the world. The last race was the 31 st race in the Aghullas challenge. These two men are known as the ”legends of the sea” say their winning recipe is attention to all detail, to stay calm in all circumstances, 16 years of teamwork, 40 years of combined experience at sea, years and hours and more hours of exercise, professionalism and of course all their sponsors, their mechanic and land team! Tjaart and David met in 2002 and started their own team. That same year they were crowned South African National -, Western province-, Trans Atlantic- and Trans Agulhas champions. They prepare for the race through the year. They do lots of gymnasium work and plenty of time on the ocean in all weather conditions. The Trans Agulhas starts in Plettenbergbaai on the 28th of December and ends in the Strand on the 1 st of January every year. The day one shift is from Plettenbergbaai to Mosselbaai. Day two from Mosselbaai to Stilbaai. Day three from Stilbaai to Struisbaai includes a night race. Day four from Struisbaai to Gansbaai. The last day from Gansbaai to Gordonsbaai. Overall the sea conditions were better than last year and the Rusgenot team won all the shifts but the last leg due to mechanical problems. The overall performance made them the winners of 2018 and hopefully, they will compete again in the 2019 race. To all the people who send emails and WhatsApp messages regarding the devastating fire on 11/1/19, thank you for your concern. Luckily the fire missed Kleinbaai but 5 houses burnt down in the Franskraal caravan park and huge fynbos veld was destroyed. We here at Aire del Mar wish you all the very best for the rest of 2019. Hopefully, we shall see one another sometime in this year.